The Daughter was up between 4:15 and 4:30 every day last week, so I didn't get as much done as I had intended on the NaGa DeMon winners' copies of Zombology. Still, the clocks have changed now, so I'm hoping that she'll be sleeping to something past five on summer time, and I can start going to bed a bit later myself - and get the last couple of copies finished off and then get them all in the post. It's Newcastle Playtest on Tuesday, so that'll be a late night and then there's Games Night on Thursday, so I'll have to fit the construction in around those. So, not much progress to report but and interesting thing did happen on Tuesday. I went to Manchester again for work (it's becoming a regular occurrence since we were bought by an American corporation whose UK headquarters are in Manchester). It's often my boss and I who go down, and since he's a Games Night attendee, I usually take my iPad full of board games to help us while away the six hours of train journeys. The boss couldn't make it this week, so I opened it up to the floor and Sam one of our two new starters came instead. Sam's also a gamer, so the iPad came too. We played a lot of games on the two journeys many of which Sam hadn't played before. The last game of the first journey was Carcassonne (new to Sam) which Sam won despite my literally hundreds of games of experience. The game came to an end, and seeing as Mr. Random Stranger hadn't got off yet, I asked if he wanted to play too. Pat (his name as it turns out) happily joined in and we spent the next hour and a half playing three player games until Pat got off at York. It turns out Pat had been to Beyond Monopoly (the games club in York I used to frequent when I lived there) and knew Jon, the guy who runs it (who used to help me playtest games when I ran Reiver Games). It's a small world. I also felt like I vaguely recognised Pat, though that might be my imagination, I've met a lot of people through Reiver Games, and I'm often bad at remembering names and faces. In case you ever read this Pat, it was a pleasure to meet you - thanks for joining in! Many years ago, while humanity was busy learning how to craft flint axes and wondering which pelts made the best loincloths, I took part in NaGa DeMon 2013, coming up with a game I called Zomobology, a quick, vicious card game about fighting the zombie apocalypse with science not shotguns. With only a month to come up with a working game, I enlisted the help of the internets, promising free stuff in return for feedback, proof-reading and ideas. NaGa DeMon went very well, I got loads of feedback, made 6 versions of Zomobology within the month and made them available print and play for feedback purposes. I had nearly four times a normal month's pageviews on the blog and everything was rosy. Huzzah! Did I mention the free stuff? Yes. Right. Um. So I'd offered the five most helpful feedback providers a signed, numbered limited edition copy of the final version as created at the end of the month. That version was freely available here for download, so to spice it up a bit, I said I'd get some exclusive artwork done for the winners' copies. The only slight problem with this plan was I'd spent all my hard-earned cash on nappies, so budget was limited, and I can't draw for toffee. Another call for help on the internet and I thought I'd found an artist who was prepared to do the artwork for beer money. Millennia passed, man learned to forge metal tools, wear togas and build sewers. Then the artist deal fell through. Man harnessed the atom and discovered quantum mechanics and the whole thing was getting farcical. Instead I offer the winners (who by this point have largely forgotten who I am) a signed, numbered limited edition copy of the current version, with crappy artwork by yours truly (plus a selection of Creative Commons licensed art from the internet). This version is actually slightly more exclusive since it's changed quite a lot since the final NaGa DeMon version at the end of November and the art, such as it is, is all new. In an effort to draw a line under the whole sordid affair, the winners accept my paltry offer and everything is back on. Did I mention it had changed quite a lot? So that version has several new mechanisms and is completely untested. So I start testing it and make a few iterations testing it until it gets to the point where it essentially works. It's not perfect (I think it's now too easy to cure zombitis), but it's playable. Let's do this! Except I've run out of ink for my printer and I've not written the rules for the new version - they're all in my head. So I crack on with this while the winners take advantage of the singularity and download their consciousnesses to a silicate substrate, desperate to not let their failing corporeal forms deny them access to free stuff. Saturday night the stars were finally in alignment. The Daughter was sleeping well, The Wife was out for dinner and drinks with friends and I was vaguely awake. I'd written the rules up on Wednesday and the printer ink had arrived on Thursday. Time to finally get my house in order. The copies are now seeing the light of day and will be shipping soon. Thank you all for your patience! ...leep! It's finally happened, after 18 months, The Daughter has finally started sleeping pretty well. We've had several nights in the last week where she's either slept through, or only woken very briefly and then gone back to sleep. It's been awesome. The Wife and I have been so refreshed that we've been able to stay up very late (like 10pm!) and spend some time together - especially good since I was away for a chunk of last week in Germany for work. So, I've not made much progress on games. 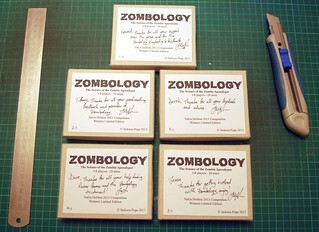 What little progress I have made has been on Zombology again. We got to play a seven player game of it at the beginning of Games Night on Thursday (it seemed to go down well - I'll be sending this version to the NaGa DeMon winners as soon as I've written up the new rules). I've changed it slightly so that it's a semi-coop game. It's possible for all players to lose, or one player to win. The first attempt I made at this was way too hard (all players always lost! ), and I fear I've gone too far the other way now, so it might need a little tweaking to make it a bit harder - it is an apocalypse after all - there should be at least some risk of being consumed head first. I've ordered new ink for my printer, so I should be able to finally make the copies for the NaGa DeMon winners next week. Which gives me this week to get the rules done while I wait for the ink to arrive. I've also been meaning to play Firefly: The Board Game again so I can try out the app I wrote for my Nokia Lumia 920 Windows Phone. I've been very happy with the phone until this week when it overheated while charging and melted the USB port to the point where I can no longer plug it in or charge it. So now it's died. It's still in warranty though, so I'll be speaking to Nokia this week about that. With no phone to test the app on, I might as well try to play Homesteaders (a recent purchase, as yet unplayed) instead. It's been a busy week. A couple of days in the office and then three days on a work trip to Germany. It was only my third time in Germany which is a bit weird since German is the closest thing I have to a second language (which is a long way from a second language!). At school I did five years of French and three of German and by the end of that I felt more comfortable in German than French. Then both my French and my German languished for many years before I started Reiver Games and travelled to Germany to attend Essen. I tried while there to practice my paltry German and on my return I took a couple of years of German classes at evening school, ready for my second Essen and beyond. Essen 2010 was only my second trip to Germany and with Reiver Games collapsing, it was my last until this Wednesday. 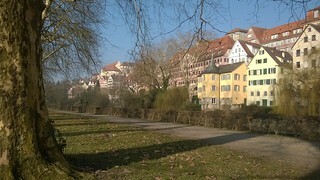 My boss and I went to Tübingen for a meeting on Thursday but it took us most of the day on Wednesday to get there and then most of Friday to get back. As I mentioned last week, in preparation for the two full days of travelling with my boss (a Games Night attendee) I'd purchased a few more games for my iPad: Small World, Settlers of Catan, Forbidden Island and Pandemic. As it turns out, we left checking in until we arrived at the airport (both times!) and ended up only spending one flight sat next to each other, so our gaming opportunities were fairly limited. We only played Pandemic of the new games I'd bought (which is a nice app that I'm glad I bought). It was a good trip and I liked Tübingen a lot, as well as what little I saw of Baden-Württemberg (out of the window on the bus from Stuttgart airport to Tübingen, while trying to concentrate on Lords of Waterdeep and Stone Age :-) ). As I mentioned last week, my role at work has changed slightly over the last couple of years, moving towards Project Management and away from Software Engineering. As part of that I've been making more trips for work, often with my boss, Ian. Ian just so happens to be a Games Night attendee, so when we travel, I take the iPad and its collection of board game apps. I used to be a very keen computer gamer as a kid, mostly RPGs and RTSs with a little first-person action thrown in too. As the games became more realistic, I started getting worse and worse motion sickness, so I gave up gaming. Similarly, my hobby design efforts moved from tiny bits of computer role playing games to fully fledged board games and Reiver Games was born. As I became more and more interested (some would say obsessed!) in board games, computer games completely fell by the wayside and I stopped playing them altogether. Board games gave you a greater mental challenge in a shorter timeframe, without the frustrating dexterity element of having to push the buttons in exactly the right order at the right time. I was a late adopter of smart phones, but we've had an iPad for a number of years and the draw of Carcassonne on the iPad (and later Windows Phone) sucked me back in. Being able to play good board games on my own when I had time to kill and no opponent was a fun way to fill the time, without the joylessness of soloing a game (which somehow feels lonely in a way that playing against a computer opponent does not). The last two years I've been to a big conference in North America (Vancouver in 2012 and Minneapolis in 2013), and I've been with colleagues who come to my Games Night, so I've taken the iPad and we've whiled away the airports, connections and transatlantic flights playing games. I love board games (obviously! ), but there's a time and a place for physical games and, for the vast majority of them, being crammed into cattle class on a transatlantic flight isn't it. But the iPad lets you play decent, complex, strategic games with almost no space requirements and as an added bonus you get a lot of the bookkeeping taken care for you and there's no setup or packing away time. The Wife would tell you otherwise, but I'm actually a fairly conservative board game purchaser. I don't buy many games, and those I do I'll get rid of if I don't like them or stop playing them. I rarely buy a game without playing it a few times first (Firefly the Board Game and X-Wing Minis are a couple of recent exceptions to that rule). Strangely, the same is true of iPad board game apps, despite the much lower price point. Until recently, almost all the apps I bought were games I owned the physical version of, and I've only ever bought one game I'd not played before (Army of Frogs, and that was because I am big fan of Hive which doesn't have a native iPad version). Since the start of the year I've done two trips to Manchester for work (3 hours on the train each way) and next week I'm off to Tuebingen in Germany - pretty much 8 hours of travelling each way - again with my boss Ian. We usually play Ra a lot, plus Hey! That's My Fish! and more recently Lords of Waterdeep and Puerto Rico. For the German trip I've also invested in Catan (I've previously owned a physical copy), Pandemic (I own a physical copy), Small World (I've played it a few times, but don't own it) and Forbidden Island (played quite a lot, but don't own). It would appear that I'm loosening up a bit. With all this choice, the two games I play the most solo are Carcassonne (when I've got a few spare minutes) and Eclipse (which I own) when I'm on a journey and I've burnt out my travel companions! While I'm very happy to play board games on the iPad pass-and-play with friends, I never play online games - either real-time or turn based. There's something about board games that I think is lost in translation if you're not all interacting in the same physical space. Do you play electronic versions of board games? Which are your favourites?